WHCA Wins Mid-County Civic Association of the Year! We're proud to announce that the Wheaton Hills Civic Association has won the Mid-County Citizen Advisory Board's CIVIC ASSOCIATION OF THE YEAR Award! Join us at the Wheaton/Kensington Chamber of Commerce Awards Banquet on Wednesday, April 24th! Please join your neighbors for the next meeting of the Wheaton Hills Civic Association at Highland Elementary School on Thursday, April 25 at 7:00pm. We'll hear from the University of Maryland on their stormwater management recommendations, from the Montgomery County Department of Environmental Protection on a mural project, discuss upcoming community activities, outline WHCA elections planned for later in the year, and much more. If you have any particular topics you'd like to see addressed, please let us know and we'll try to include in the meeting agenda. Email WHCA at wheatonhillscivicassociation@gmail.com. Washington Gas will replace 12,000 feet of main with plastic pipe and replace 228 services to homes, starting in few weeks, concluding late summer. Victor Martinez will be the Washington Gas Construction Supervisor on the project. He can be reached at vmartinez@washgas.com. In our ongoing effort to provide safe and reliable natural gas service, Washington Gas will begin construction to replace gas main and service lines. The selection of mains and services to be replaced is based on a number of criteria including age of pipe, leak history, type of material as well as other factors. Washington Gas will provide a letter/communications throughout the project to customers directly impacted by construction efforts. Crews will install a new plastic gas main. Service crews will then start the replacement of existing services. Prior to the actual start of the service replacement, customers will be contacted by a technician to schedule the date of their service replacement. Every effort will be made to minimize disruption to homeowners’ properties. Gas will be off during the service replacement, but no longer than one day and we will work with the businesses to allow them to continue to operate. Please note that the time needed to complete the construction taking place in front of individual properties will vary but, in general, will not be longer than a few days, depending on conditions. Relighting of gas appliances will be performed after the service replacement is completed. Customers must allow the service crews access to all gas appliances to ensure a safe restoration of gas service. Our crews will make temporary repairs to any excavations in the roadway and sidewalk. Permanent paving repairs will follow as quickly as possible, after all work has been completed, to as closely to as-found condition as is possible. 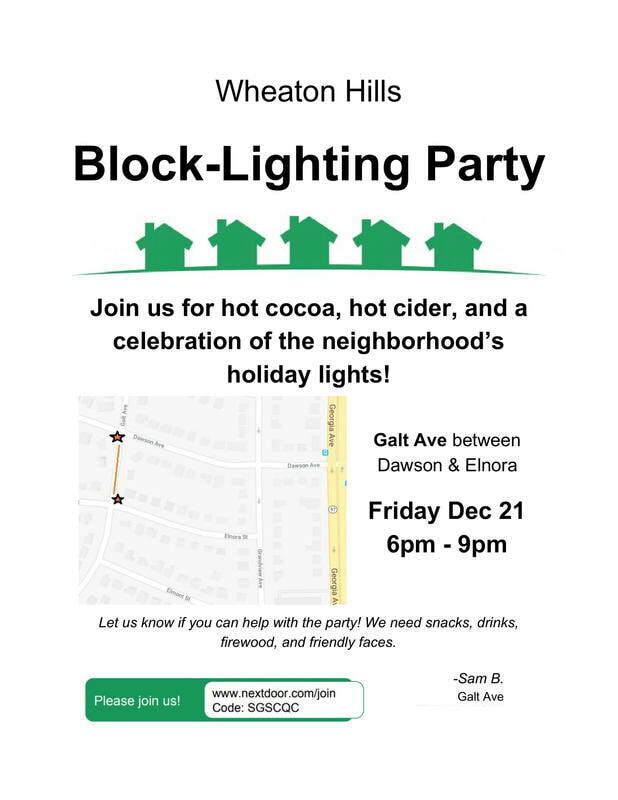 Hot cocoa, hot cider, and a celebration of the neighborhood's holiday light displays! Community Meeting - Wed, Nov 14!!! 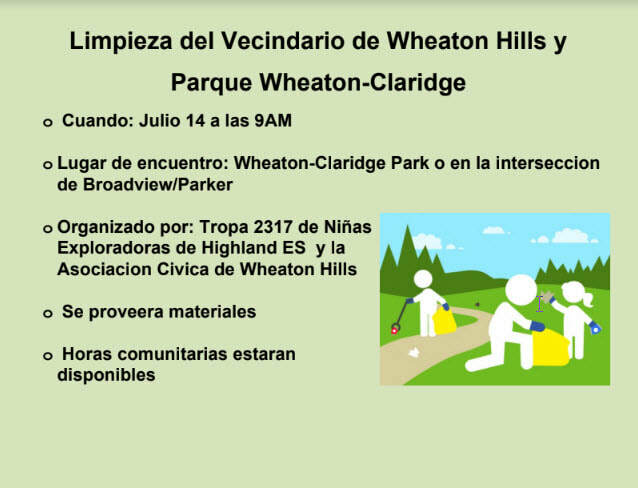 Please join your neighbors for the next meeting of the Wheaton Hills Civic Association at Highland Elementary School on Wednesday November 14 at 7:00pm. The main topic will be addressing stormwater runoff issues (flooding on neighborhood roads during storms). We also hope to recruit Block Captains for the neighborhood as points of contact for organizing activities and helping relay your concerns to local government officials. So if you are interested in getting involved in community organizing please come to the meeting! The WHCA Executive and Environmental Committees will meet with representatives from the University of Maryland's Environmental Finance Center (Sustainable Maryland) to review existing County programs for homeowners, and to discuss persistent rain/stormwater runoff issues in the neighborhood. A walk-through of sections of the neighborhood will highlight particularly problematic areas. WHCA will then receive a study with recommendations later this year. 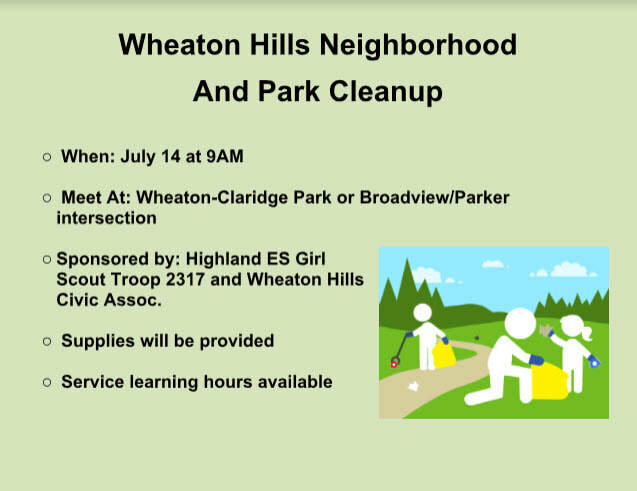 In partnership with Girl Scout Troop 2317, we're doing a neighborhood clean-up on Saturday, July 14. 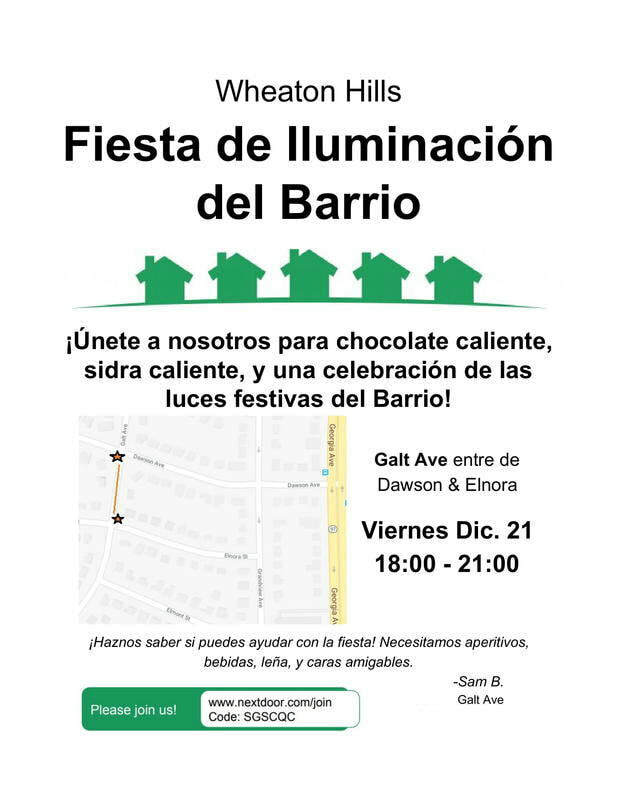 We'll meet at two locations (Wheaton-Claridge Park or at the intersection of Broadview and Parker Avenues). Supplies will be provided, courtesy of the Department of Environmental Protection. 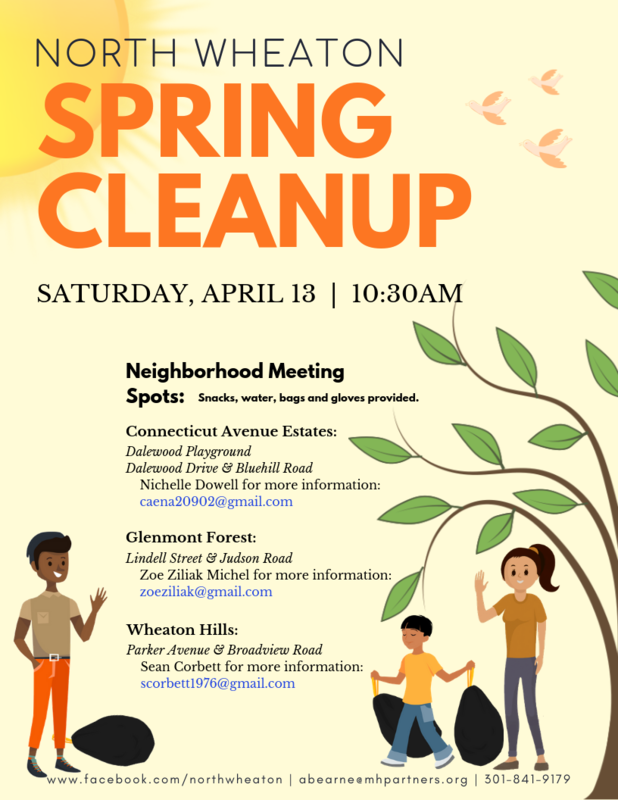 Join us for this semi-annual event to beautify Wheaton Hills! 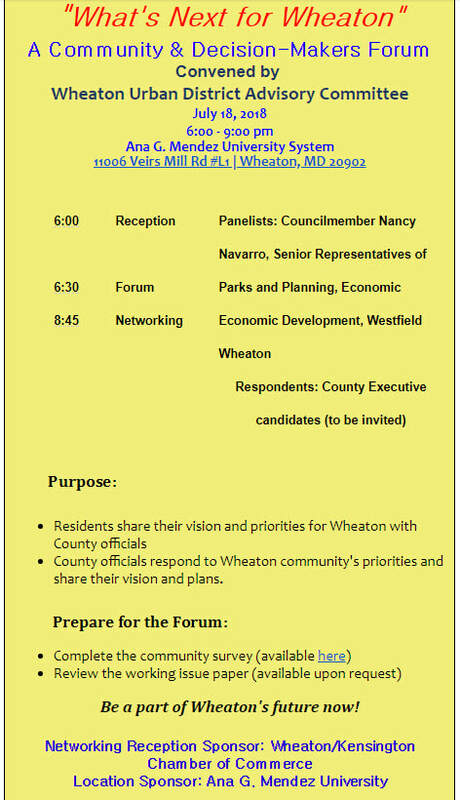 WHCA leadership will participate in the Wheaton Urban District Advisory Committee (WUDAC) discussion session with county and elected officials regarding visioning for the future of Wheaton. Residents are encouraged to attend and participate as well! Event is at the Ana G. Mendez University (11006 Veirs Mill Road #L1) at 6:00 PM on Wednesday, July 18, 2018. 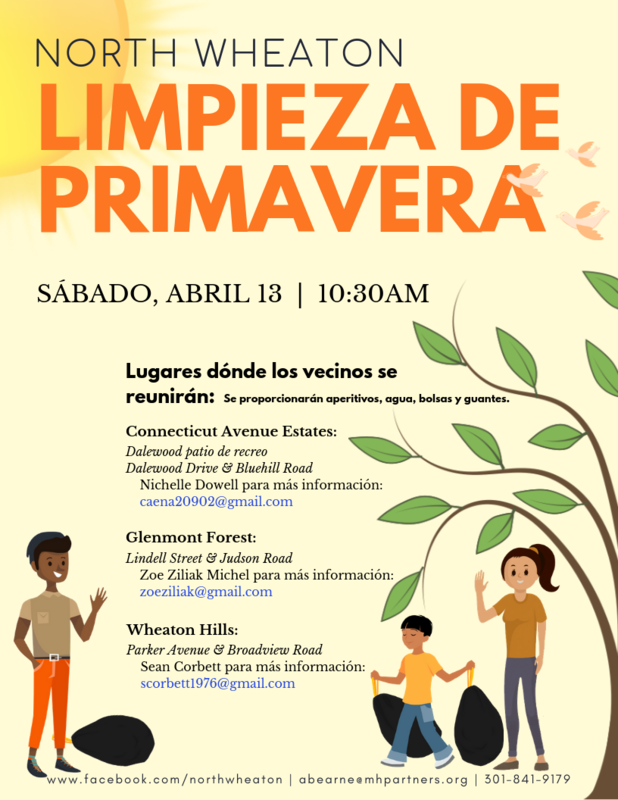 WHCA is partnering with our neighbors from Glenmont-Forest Neighbors Civic Association and Connecticut Avenue Estates, with funding and support from Montgomery Housing Partnership, on a wonderful, family-friendly community event. 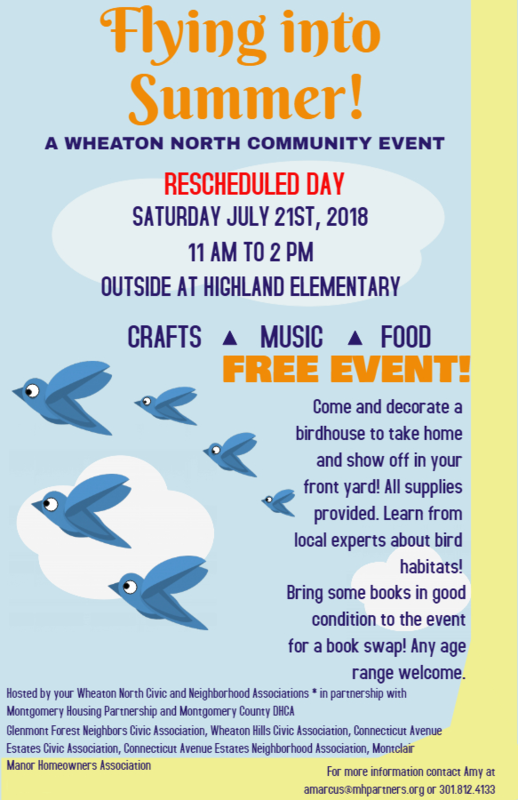 Join us for Flying into Summer on Saturday, July 21st from 11AM to 2PM at Highland Elementary. 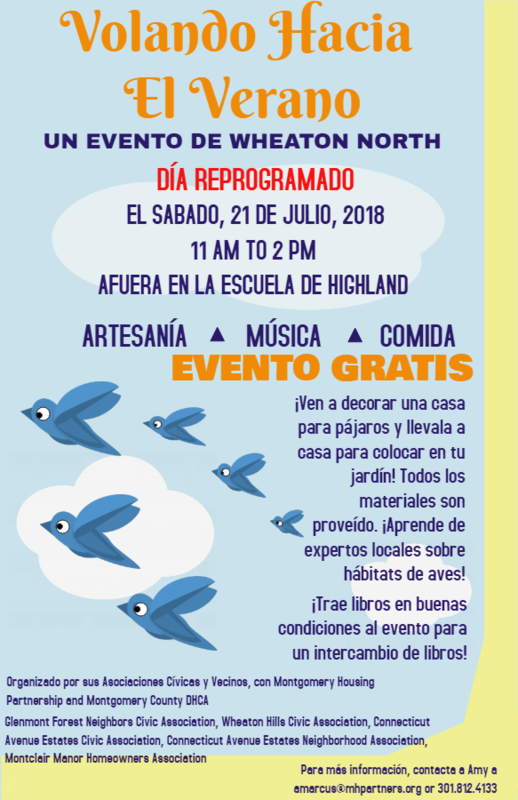 We'll have birdhouses for kids - and adults alike - to paint and take home, along with other fun activities! The linked article appears in the Saturday, June 30th print edition of the Washington Post. Update: A PDF version of the article is attached below.